- Shops can have "Stock" and only sell if they are in stock. Use ListBuilder to generate a list of items for AdvShop. Click here for Vault which provides economy integration. Items are more expensive if not much of it has been sold compared to other items. The default-sold and default-bought values are the stock of an item after it has been sold/bought for the first time. It is a good idea to have the buy formula return a larger value than the sell. Once you have done that, remember to change the idlist in the config to specify the new file. Transactions are automatically logged to history.yml. With ChestCommandsGUI you can execute commands (e.g. /advsell) when a block is clicked. Yet no matter what, when I punch the sign it sells the item but for 0$ regardless of what price I put on the sign and tells me in console invalid sell formula or buy whichever way. Hey, whenever I edit the english.yml file as in changing its colors, and then reload the plugin, it won't save the changes I made. Can you fix this? Is there any way you can seperate the /advsell command and a sell via sign as seperate nodes so that people dont exploit advsell on items you don't want them to sell. There is one thing that I just need to know. Also, before you read this, take in mind that I am not stupid. How do you change the worth of items? I don't want an apple to sell for $0.05 or whatever! May you please help me? Thanks for reading! You should add /AdvSellTo [user] [amount] [price] if you have 100 blocks in inv then you put 100 for amont and select price. Popup on their screen user is selling you blank amount of blank for blank. ./acceptsale 10 (sale id) or declinesale 10. Also do /AdvOrder [item] [amount] [price] . It announces user orded blank amount of blank for blank. order id is 10, do /order deliver to fill order. Person who filled order auto gets paid then other one gets items if offliine when logs on says you ahve these unclaimed oreders. Do /advorder claim [id]. people can to /advorder list to display unfilled orders. they can /advorder cancel. Finally a great addition would be if you have 100 stonebrick and you do /advsell 101 stonebrick, instead of saying you can only sell 100 it should jsut sell 100 as thats the most you have. same with /buying 100 stonebrick. If you have 64 slot then it should only buy 64. Those are just some suggestions. @DivinityCraft Sorry man. I must have uploaded the wrong file, since it shouldn't have those debug messages. The crashing of the client can be attributed to that (I think). I'll get my old potato out to see if it's better. So yeah... I kinda screwed up, but I'll make sure all those issues are fixed in the next version. Also, when attempting to sell damaged durability items using any sell command, the player crashes and no sale is made. I do not think it should be possible to sell damaged stuff but the crash issue must be sold and perhaps have a message added that says you can't sell damaged gear. Should be working well enough in the next version. - I'll do some more work on it in the future so that it's ultra-fast. Signs should be documented now. I have a bug to report. Sellall can cause major lag and disconnect the player and possibly even crash the server. I've checked the history file and I believe the issue with sellall at least is that it seems to create huge amounts of duplicate transactions. For example, selling twenty stacks of something creates 20 transaction messages, one for each stack, which are then duplicated 64 times each creating a total of 1280 lines in the history file. Due to the immense lag caused I presume this weirdness is due to the way the sale is handled in the code, not due to a problem in the way the history file works. The issue does not appear with other sell commands from what I can tell. Hyperconomy does not have any lag issue when selling large quantities so it must be possible to solve this. I suggest as a quick fix until you find a better solution you put in some small delay in the transaction code to slow it down enough to avoid lag. The players will be fine with transactions taking a bit longer to finish if that means they can avoid the crashes and lag and get /sellall (I had to disable it due to the constant player and server crashes). I'll be happy to send you our history file if it would be of any help. How do the new signs work by the way? I can't seem to find any info on it. It would be easier to you, because in ChestShop there is almost all done with code and one thing that you need is to create plugin which changes prices automatically when buying/selling. As the stock levels don't matter as much as the amount of items (GL Clicking the sign a billion times for a few stacks of stone or cobble), also the signs only activate when you place a block on the sign (Maybe your using block place event instead of Interact event?). I have my own sign addon for this plugin that works nicely, however knowing that both formulas don't work has stopped me from using this plugin for the time being. Create a sign by putting [advbuy] or [advsell] on the first line followed by the item you want to sell. I haven't fully implemented in the autoupdating, so it only updates when you buy something from it, or left click the sign. As for a ChestShop addon, how would that work? 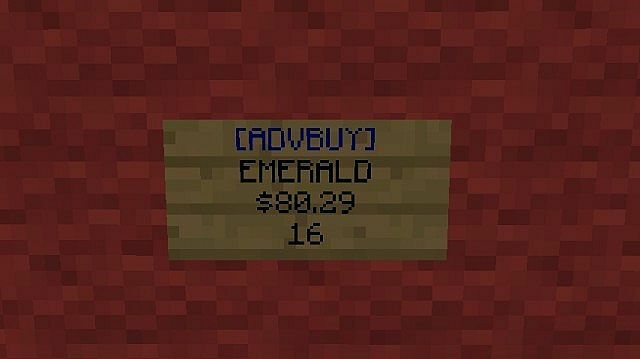 I suggest you adding this plugin as ChestShop addon P.S How to create signs? I'm not great at programming, but I know my way around java, If you would like some help in making that todo list shorter you can send me a msg! This formula makes the price of an item be based on its stock, the lower the stock the higher the price, thus making it more attractive to sell items low in stock which ensures they do not run out. The pick a number is what price your items should have when there is only 1 in stock, this affects what price your items will have at all stock levels. This gives all items a starting stock and ensure players will not make extreme amounts of money when the plugin is new. Empire92, for the sake of the success of the plugin, I suggest drawing inspiration from these settings to stop the issues of the default config with its hyperinflation and emptying stocks. I would also like to report a minor problem, when an item has 0 stock and you sell the first item to it you get an error message and while the item is added to the shop and removed from your inventory, you get no money for the sale. The error message is is "An internal error occurred while attempting to perform this command"
I also have a small feature request. When you type a buy or sell item command but left out the item amount it would be practical if the sale/purchase went through anyway with 1 as default, Hyperconomy uses this system and it's very handy. For example, a crafting table is something you almost always want just 1 of, so you should be able to type /buy craftingtable and you get 1. The default pricing formula does not work, my medium-sized server (30 online during peak hours) has been using it since may 1 and while everything seemed fine during the first few weeks with stocks filling up and prices balancing out, things took a turn for the worse later on. The default pricing formula seems to create steadily-worsening hyperinflation once a certain total number of items have been sold. The huge amounts of money being generated has made money itself pretty much worthless and gives people incentive to buy useful items for all their money while selling crap to get money for this. Therefore we now have a situation where the stocks of all useful items are always empty while useless crap like dirt is well-stocked and people have millions upon millions of money. I'm trying to figure out a different formula but I'm no mathematics expert, just a business/economics guy, so it's not easy. I have figured out several ways it could be solved but I simply haven't figured out the math to make them reality yet. How do you use the name for a two or more word item? If I do /advbuy or even /value Steel ingot (which I added) I get did you mean steel?, If I try /value steel I get, did you mean steak?, If I try Steel_Ingot, I get did you mean steel? I take it multi-word items are not supported. Second Question, at what point to prices start to drop? I sold all my cobble and made 410k... without noticing any diminishing returns. I would assume as the market is now flooded with cobble, it would have dropped as I continued to sell it. I understand time is a factor as well, but I would think significant stock should also decease the buy/sell price. Any luck with enchantments? If you can't find a solution then perhaps you should use the Hyperconomy method of trading the enchantment itself rather than the enchanted book.